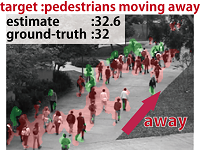 pedestrian number by using single camera in the crowded environments. Counting people is valuable for applications such as traffic analysis. sufficient estimation accuracy and reduction of training time.